November 2, 2017 November 2, 2017 Dan O. A bunch of Syrian rebels who call themselves “Raqqa is Being Slaughtered Silently” risk their lives to document the atrocities committed by ISIS in their homeland. And what happens next is that not only do their guerrilla-style journalistic-ways get the rest of the world to notice just what the hell is going, what ISIS is all about, and what’s to come of many more cities/countries to come, is that their lives are put in-danger. After all, ISIS’ big support is social-media and the persona that they have created heaven on Earth – distort that in any way, or basically, tell the truth, then they will find you, hunt you down, and kill you. It’s why the original-members/editor-in-chiefs of RBSS have to be constantly aware of their surroundings, at all times, and not necessarily sure of what’s to come next with their lives. But at the end of the day, it’s all for a good-cause, but at a cost. 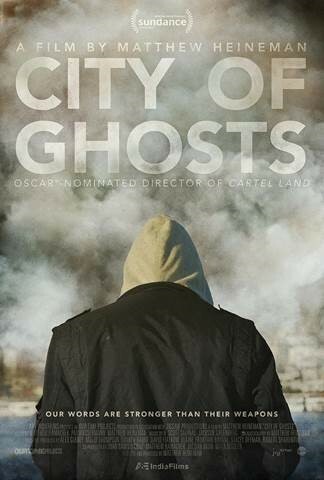 I’m a little torn by City of Ghosts because while I’m happy that director Matthew Heineman was able to make a movie about citizen-journalists, doing their jobs, but also doing it for the better of the world to come, it also feels a tad bit messy. It’s the kind of movie that wants to make a statement about how awful and evil ISIS is and, if we don’t wake up sooner or later, then they may become more of a threat than we could have ever imagine, but at the same time, also talk about these journalists and their lives. Neither viewpoint is wrong to be focused on, but in the same movie? It kind of doesn’t work. And it’s why City of Ghosts, while I appreciate the story it is highlighting, the subjects, and its cause, as one whole production, it can’t help but feel like it’s attempting to do a few things at once. There’s no denying that Heineman himself keeps things moving, interesting, informative, and most importantly, compelling, but even he struggles a bit with what, or whom, to focus on. The editor-in-chiefs of RBSS are worth spending a whole movie about, which is what Heineman does; he sees these people as nearly flawless, yet fragile human beings who are willing to risk it all, for the sole sake of informing the world. They deserve our tribute and Heineman, while not one for shying away from the ugly details of their sacrifices, also can’t help but paint these fellas as true angels of the world. Just an everyday guy here, people. Nothing to see. That’s okay, though, because they deserve it. What they probably don’t deserve is a movie that seems to want to also talk a whole lot more about ISIS, too, but just doesn’t know how to do so in a cohesive manner. And I get that it’s a rough trick to pull-off; being a history-lesson about ISIS, their origins, and just what the hell they are, is a whole lot more extensive, than just focusing on a news organization and its members. But like I said before, together, it just doesn’t quite work out. Still, it deserves to be seen. Not because it’s a movie about the evil sadists that are ISIS, but because it’s a movie about good journalists, doing good work, reporting on news, sharing everything to the whole world, and oh yeah, not being made-out to be liars or “fake news”. And this is all in 2017, people. Just take note of that. Consensus: The two story-strands of City of Ghosts doesn’t fully come together, but as a look at journalism done right, in today’s day and age, it deserves to be seen.